Thursday 21st February 2019, 7.30pm. 6.8km, 180m climb. £1 entry on the day (but see below). Last entry 7.15. New course for 2018! The course starts on a good wide track but after 500m cuts left up a steep bank. From then on it is either on narrow paths through the woods, or on no path at all. 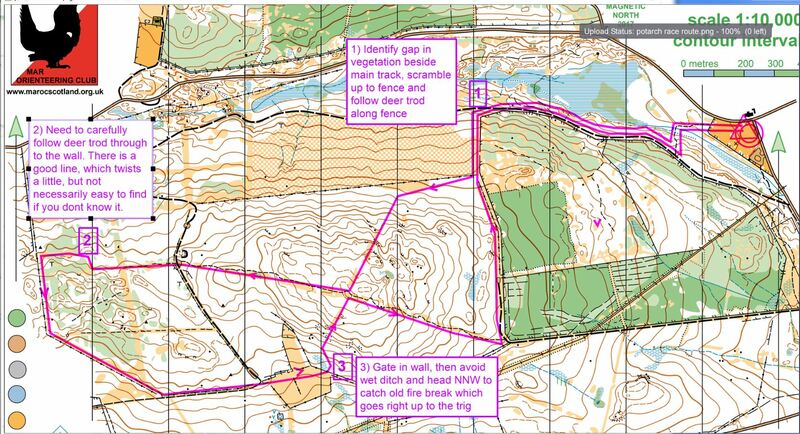 There are two climbs to the trig point on Craigmore hill up fire breaks, and two very nice descents on a good path. The final kilometer is the recerse of the first one. Registration and prize giving will be at the Potarch Inn, across the bridge over the River Dee from the A93 just east of Kincardine O’Neil.The cafe will be serving soup, teas, cakes etc so bring some money. Runners will be required to have a good headtorch, and to carry full body cover, a map and compass (just in case they got lost in the woods at night in the middle of winter). A spare torch is also a really good idea.